Did you know that Winston Churchill stayed in bed until 11am on most days? You don’t need an productive morning routine to succeed. Here we list 23 ideas for a productive morning routine. There are two patterns which arise 90% of the time when speaking to high performing individuals about their morning routine. 1/ The routine takes place at least five days a week, with little change. 2/ The routine involves various elements which are included to optimise the rest of the day. This could be anything, from diet to exercise, to creating a particular frame of mind. It is likely that you will already have a morning routine in place. We recommend trying out the ideas listed here to find a combination that works well for you. Almost everything you do is the action of habit. Habits which you have built up of the course of your life. These are either positive or negative. Tracking your morning routine before changing it allows a well-structured period of change. It is important to isolate each element of your routine, and then determine the effect this has. The effect could either take place in the morning itself, or during the rest of the day. It is usually the latter. For example, having only a slice of toast as you dash out of the door. Am I maximising my energy levels by doing this? What is the effect of this? Do I rush out of the door every morning frantically? Is that making me feel anxious for the rest of the day? Why is that happening? Once you identify the changes that need to take place to swap negative habits for positive ones, you will be able to experiment. Set your alarm for the time you will wake up. Stick to it. Many people experience an overwhelming temptation to snooze in the first five minutes of waking up. This has led to reports of over 50% of 25-34 year olds pressing snooze daily. A snoozing routine at the start of your day is detrimental to your natural energy levels for the rest of the day. Furthermore, the sleep we get through snoozing is not physically beneficial compared to a natural sleep. Once you have set out your optimal morning routine, work backwards and determine what time you need to be asleep by to get your desired amount of sleep. Think of killing the snooze button as 2 minutes of pain for 12 hours of productivity. Try it, and see how much more energised you feel each day you don’t snooze. It is no secret that dehydration has detrimental effect on productivity. It is also a fact that many people don’t even know that they are dehydrated. Naturally, after a sleep we have spent 6-8 hours without water. Your body will be dehydrated when you wake up. This is why one of the first things many people do it drink a lot of water. Recommendations vary from 500ml – 1.5 Litres in the first hour awake. It is best to determine an amount that works well for you. The benefits of drinking water early include: Early re hydration, flushing out toxins, staying ‘full’ for longer and a boosted metabolism. Finally, your brain is over 75% water so drinking water early will help boost energy levels. Water can take up to two hours to become fully absorbed in the body, so it makes sense to do it early. 4/ Get ahead the night before and eliminate early decision making: Daily Planning. Evening habits may not be the first thing you thought of when you clicked on this blog post. However, getting ahead has been included because it does eventually become a part of your morning routine. This includes writing your to do lists the day before they will be completed. This has two main effects. Firstly, you are able to write down tasks while they are fresh in your mind. Secondly, this sets you up for the day ahead, without having to spend time deciding how to organise your day. CEO of American Express Kenneth Chenault ends his evenings by writing down three things he would like to achieve the next day. Getting ahead also includes streamlining the mundane tasks of the morning, such as picking your outfit, or packing your lunch. Do this in the evening, lay it out, pack it. Your decision-making skills are not at their best as soon as you wake up. Thus, it is a good idea to keep early morning decisions down to a minimum. This also reinforces the idea of having a solid morning routine. 5/ Chuck a Smoothie in. Smoothies boast multiple advantages to whole meals. Most importantly, nutrients are more easily absorbed from Smoothies. Thus, smoothies are perfect for an early morning energy boost, allowing you to get the most out of your day. A Banana, Berry and Oat smoothie packs a punch in the morning. And it only takes two minutes to prepare! Try it, and get the most out of your morning hours. If you are rushing in the morning before work, this should be the first thing you address in your morning routine. The effects of a rushed morning will be felt throughout the rest of the day. Stress, anxiety panic. They will be felt not only by you, but also by the people you encounter throughout the day. There are two things you can do about this. A: Wake up earlier. This does not mean set your alarm for 6 and snooze till 7. Wake up early and complete a morning routine without rushing. Watch your productivity shine through as your early mornings and routines become habit. If you are worried that you won’t get enough sleep, go to sleep earlier. B: Streamline your routine: By streamlining your morning routine and becoming more disciplined, you can be more time-efficient in the morning. This does not mean that the quality of your morning routine decreases. In fact, it can be greatly increased. Most people’s diets are lopsided. They will go something like this: Cereal/Croissant for breakfast, Sandwich/Snack for lunch and a large meal at dinner time. This is the exact opposite of what is required for a productive day. The tendency is to eat more food, just when the body needs less. Eat a healthy, hearty breakfast in the morning and cut down the size of your evening meal. Don’t have time for a large breakfast in the morning? Make time for it and see what a difference it makes to the rest of your day. The addictive properties of social media are well documented. This is a problem as a ‘quick check on social media’ can soon eat up valuable time of your morning. Not only does, it eat-up valuable time, but it also distracts you from what really matters. You and those involved directly in your world. Cluttering up your mind with other people’s views does not set you up well for the day. There are various app’s and plugins you can use for this. Alternatively, if you have an iPhone, go to settings > battery > usage and look into how long you have spent on each app over the past 7 days. It can be quite a shock. Eliminate social media from your morning routine end enjoy a more productive, focussed frame of mind for the rest of the day. The same applies for emails as studies have shown how waiting till later can lower stress levels and increase positivity. When you shoot out of bed and open the curtains, it is likely that your brain will not be operating near its best level. At this stage, decision making should be kept to a minimum and optimised through routine. However, a beneficial inclusion in your morning routine could be a review of your schedule for the day. Whichever technique you use to organise your day, a couple of minutes spent reviewing your schedule can be highly beneficial to the rest of your day. By doing this you increase your focus on the tasks ahead, increasing clarity in your mind. Reviewing your days schedule can also help train your subconscious to work on logical solutions to the tasks ahead. It’s no surprise to anyone that exercise is extremely beneficial, both to your mental and physical health. Why aren’t we doing it as regularly as we should be? Habit. Or ‘lack of time’ as many people like to say. Building exercise into your morning routine is beneficial for three main reasons. Firstly, early morning exercise helps us to wake up, releasing a surge of feel good hormones setting us up for the day. Secondly, when exercise is built into your daily routine, it becomes habit. When something is habit, rather than sporadic, it is more likely that the action will be repeated regularly. When an exercise is repeated regularly, the benefits are greatest. This will leave you looking and feeling great over time. Finally, exercise is less likely to be sacrificed for other activities this way. Exercising during the ‘less-social’ hours in the morning decreases the chance that other social activities will come up instead of exercising. You can read further into the effects of exercising on productivity in our blog post. Once you’ve shot out of bed in the morning, open your curtains. Let the light pour in and watch the natural effect this has on your body. This includes an increased level of perception in the morning and improved mood. This will also aid the body in controlling the Circadian system. Obviously not everyone has the luxury of daylight when waking up. All the more reason to utilise it if you do. A Grande Americano is not the way forward. While many people believe that they ‘need a caffeine fix’ in the morning, going for a super high caffeine drink straight away will not be beneficial. Space out your caffeine intakes into smaller cups, or switch to tea. This will provide a boost without being overwhelming causing an increased heart rate and anxiety. Or better yet, include exercise in your morning and you won’t need caffeine in the morning! Gratitude is not simply thanking someone for opening the door for you. It goes a lot further than that. It could range from expressing gratitude to yourself in the morning, to calling up a friend and expressing gratitude this way. Expressing gratitude has been linked to improved physical and mental health. It has been shown to reduce aggression and increase empathy. As well as this it has been linked to improved self-esteem, improved sleep and increased mental strength. Your morning routine may not be the best time to ring your Aunt and tell her thanks for her support recently. However, there are numerus exercises you can integrate in your morning routine to express gratitude. You could write down something you’re grateful for each morning. You could say them out loud in the shower. You could say them out while walking the dog. You could even invest in a gratitude journal. It all depends how far you would like to go with it. Integrate this and you will see positivity flourish. When a certain song feels like it takes you to another realm of inspiration and positivity. It is no secret that humans and music are connected. However, cranking on the music as soon as you wake up is not something that is done so often. So consider switching on the music as soon as you wake up. It may not be for you. However, it is likely that you’ll be dancing round the pad in no time. This positive effects on the mood can be enjoyed through the rest of the day too. Try it out! Tip: Don’t use the same music every day – you’ll wear it out! 15/ Respect your Body Clock. Body clocks are naturally different depending on your genes and through different stages of your life. You may have heard that early risers are the most productive people. However, this is not the case for everyone, and it’s important to respect that. Wake up too early after getting to sleep late will lead you to burn out. Aligning with, and changing your body clock will take time. If you are looking to get to sleep earlier and wake up earlier, do it gradually. It is not surprising that meditation or some form of mindful practice is included in the morning routines of many high performers. Such practices boast multiple benefits, such as gaining a greater control of your thoughts. This allows you to reach a proactive state of mind, rather than a reactive one. Many studies have shown how such practices can reduce Stress and Anxiety. While they are not currently sure how this works, it is thought that there is a link with the Parasympathetic Nervous System. This is through slowing the heart rate, slowing the breathing rate and assisting blood flow. As well as this, such practices are great for gaining a broader perspective and improving overall well-being. It may be one of those things you can never image yourself doing. Try it, see if it works for you. It could be a powerful element to integrate in your morning routine. 17/ Listen to a Podcast. The podcast is the perfect resource to turn your down-time into up-time. Develop the habit of listening to intellectual podcasts in your morning routine. The awesome thing about podcasts, is that they are so flexible around your routine. Listen to them while walking the dog, while on the Treadmill, or while on the way to work. You may find that a podcast is extremely thought-provoking, which can set you up perfectly for the day. Turn your down time into up time. Try it. 18/ Start the day with an easy task. This doesn’t need a great deal of introduction. Start your day off with one easy task, such as making the bed. This is easy for your brain to do habitually when you wake up. It can also in itself act as a cue for the habits which follow in your morning routine. In an increasingly digital world, we are spending less time outside each day. – Reduced risk of early death. – Sharper thinking and creativity. Nature is not there just to be enjoyed on weekends. Include it in your morning routine and watch your productivity flourish. The benefits of stretching daily are huge. However, many of us don’t have the discipline to do it. – Promote blood circulation: This has long term effects on improved cell growth and organ function. This also has short term effects on circulation with regards to oxygen reaching your brain. – Boost energy levels: Muscles tighten up when we are tired, causing us to feel lethargic. Stretching in the morning can provide us with an early morning energy boost. – Decrease risk of injury: Stretching significantly decreases the risk of injury. This is extremely important, particularly if you lead an active life. – Enables increased flexibility: When you are more flexible, your body requires less energy to do the same movements. This means that energy can be directed to more productive areas instead. – Increase stamina: Stretch more and you’ll see an improved blood circulation in your body. 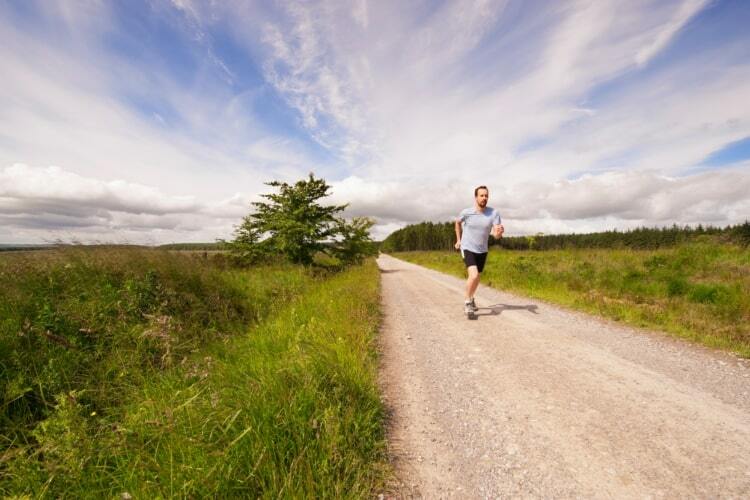 Increased blood circulation leads to an efficient transfer of blood and increased endurance. – Improve posture: Stretching the back, the chest and shoulder areas lengthens the muscles are around the spine area. This leads to a better spine alignment and with reduced pain there is less temptation to slouch. – Improve outlook: Stretching is linked with the release of endorphins and with it a positive outlook and euphoria. A perfect way to start the day. The benefits of stretching daily are abound. Add this to your morning routine and see how you get on! The large majority of people you speak to will know when they have changing energy levels and performance levels throughout the day. It is important to understand that these peaks and troughs can be managed to a degree, which is precisely why a morning routine is so important. It is also important to understand that some of these peaks and troughs occur naturally. It’s time to experiment with your morning routine and combine the elements listed here to find your optimal outcome. Find what works for you. Optimise it. Embrace it. 22/ Shower in cold water. A cold ‘Priming’ routine may be out of reach for most of us. A cold shower is not. – Improve immunity and circulation. – Improve health of hair and skin. – Speed up muscle soreness and recovery. – Helps to relieve depression. This is similar to working out early in the morning. It requires discipline and grit. However, the benefits are immediately noticeable. There is nothing stopping you from starting off with a warm shower and ending with a cold one. Try it and watch your energy levels surge. 23/ Ask yourself: What would make me feel fulfilled at the end of the day? This is a simple one that takes no longer than one minute. It is also great because you can combine it with other elements of your morning routine, such as when you are exercising or commuting to work. Simply ask yourself ‘What would make me feel fulfilled at the end of the day?’ . This has the dual effect of creating focus in your mind and increasing clarity in what you will achieve in the day. Variations of this have been popular with individuals such as Steve Jobs. It is clear, even by just looking at this list that there are far too many possible elements of a morning routine to include them all every morning. It is recommended to try out different elements listed here and determine what works well for you. The best thing is that you can combine morning routine habits to create a positive mindset for the day. Once you see your morning routine as a combination of simple habits, you will be able to make greatest use of the points listed in this article. After you have determined the elements that work well for you, optimise the routine and use it daily. Depending on your starting point, you could see a dramatic increase in your productivity. Now it’s time to implement it. Think we’ve missed something out? Get in touch.